Mughal dynasty ruled in India from 1562 to 1707. This dynasty was surely unique of all sites. They are intelligence, curiosity, artistic and the liker of literature. The founder of Mughal dynasty was Babur (1487-1530). Emperor Jahangir was one of the most peaceful, intelligence emperors in Mughal dynasty. Jahangir ruled India form 1605 until his death. He was died in 1627. His father Akbar was made the great military and political achievements. Jahangir’s realm was largely peaceful. Borhanuddin Khan Jahanguir translated this book. Somrat Jahangir was an irresistibly curious traveler, huntsman and lover of nature. He also loves poetry, gems and architecture. He was always strike to tolerance, particularly in religious matters and he was always willing to hear the opinions of members of his region. Therefore, we can say that he was a great emperor, his biography is proved by different organization, and Borhanuddin Khan Jahanguir translated the book Memories of the Emperor Jahangir. So, here you go! 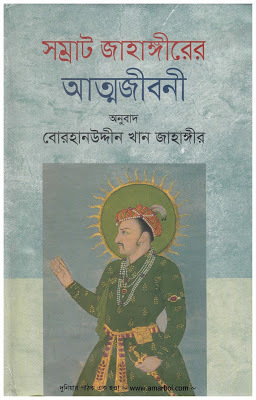 if you need this wonderful Bangla book to know well about the great Mughal emperor Jahangir, you can download it. If you need this Bangla book, you are required to click here!